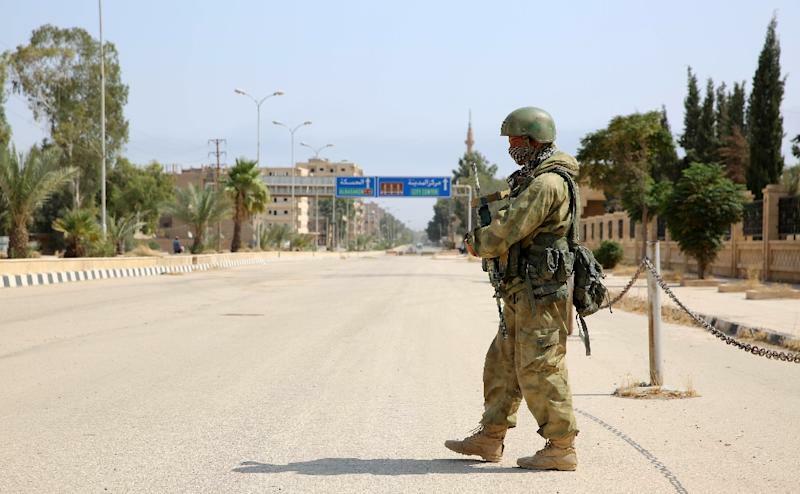 Beirut (AFP) - At least 26 Syrian regime forces and nine Russian fighters were killed in an Islamic State group attack earlier this week in Syria's eastern desert, a monitor said Sunday. The Syrian Observatory for Human Rights said the jihadists had targeted a group of Syrian and allied Russian fighters near the town of Mayadeen in Deir Ezzor province on Wednesday. "There were 35 pro-government forces killed, including at least nine Russians. Some of those Russian nationals were government troops, but not all of them," said Observatory head Rami Abdel Rahman. The remaining 26 were all Syrian forces, he told AFP. The Russian military is backing Syria's army with air strikes and troops, but there are also widespread reports of private Russian mercenaries on the ground. The defence ministry in Moscow said Sunday four Russian servicemen had been killed in clashes with militants in Deir Ezzor. It did not give a date or precise location, but the Observatory said it was the same incident as the IS attack near Mayadeen. Two of the servicemen were "military advisors commanding the Syrian artillery" and were killed on the spot, the defence ministry said. It said two more Russian soldiers died later in a Russian military hospital following the fighting. Three other troops were wounded. The ministry said the fighting lasted around an hour and left 43 militants dead.